Sr Tue Nghiem has been practicing for many years along side Thay in Plum Village, France, first in Lower Hamlet and now in New Hamlet. She ordained in 1993 and belongs to the Fish family. Sister Tam Muoi: Where were you born? Sister Tue Nghiem: I was born in Vietnam but I came to the United States when I was about 10. TM: Did religion have a place in your family? TN: We were a Buddhist family but not practitioners until we met Thay. The temple that we went to, all we did was chanting, praying, but no concrete practices for everyday. I met Thay in 1985 when I was 15 when our temple organized a trip to hear a talk by Thay in the Bay Area. I became a vegetarian from then on! TN: Thay was very young back then, but he was revered by all the monks and lay people. He impressed me because he gave a talk to us, the young people, in English. I thought the practices he shared were so simple and inspiring. TM: And your first impressions of Plum Village? TN: After graduation, my brother who had already become a monk at Plum Village (Thay Phap Dang) invited me over as a gift. I had such a great time, meeting young people from all over the world, and many Vietnamese like me brought up in the West. Being in Plum Village was the first time I really felt at home. Before that I’d always felt out of place, always this conflict inside of me, caught between 2 cultures. It was the unconditional acceptance of everyone around me of who I am that created this feeling of being at home. Later, I went back to PV for the Winter Retreat but I was shocked! It was cold, muddy, we had to wear clogs, it rained a lot, but the real difficulty was that there were no distractions whatsoever! No tv, books, friends or holiday atmosphere and I was the youngest. So I was forced to look inside, it was the most difficult time. TM: But you stuck it out? TN: I sure did. It was the practice that helped me. That winter Thay taught Manifestation Only teachings and having studied psychology I saw the depth of Buddhist psychology. It teaches how the mind works, mindblowing, so different to what I’d learnt at university. I’d had 4 years of theory with almost no practice you could do to learn how to be happy or to know who you are. I’d received no answers, only a degree. 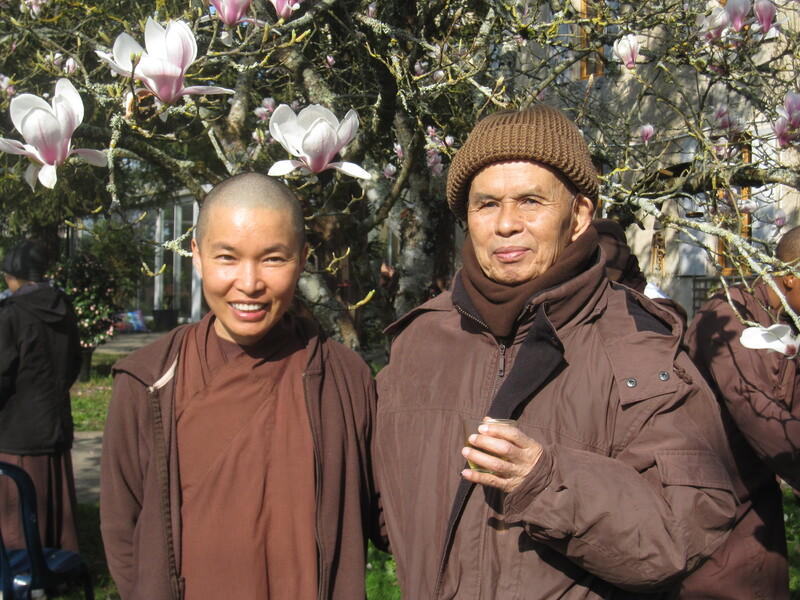 Thanks to Thay’s teaching he gave me practices to deal with what was unfolding inside myself. During that Winter retreat there was nowhere to run. There were only 5 or 6 sisters and about 10 lay friends, it was quiet! I stayed on but discovered inside myself a nagging feeling. I had to decide, do I become a nun or do I go home? It was quite scary, a decision for my whole life, but I didn’t want to confront it. And it was only when I left Plum Village for and returned to the US that I decided to become a nun. There were many factors involved. For a year living mindfully, I was looking at everything with different eyes. Going back home was a cultural shock, seeing how people consume in California and this was 24 years ago! I’d thought what a beautiful way to be in the world, caring about the planet and how we consume. TM: What did your family think about your decision to become a monastic? TN: My brother had opened the path for me; my family had seen his happiness. When it was my turn to decide to become a monastic, they supported me wholeheartedly. TM: What have you learnt about yourself? TN: One of the things is that there’s so much about me that I don’t know, not just my suffering but the potential that I have. I discover new things about myself all the time. TN: To be able to share in front of people. I used to be quite shy and nervous. TN: I ask myself “Where is this coming from?” to be able to hold the energy of a group, I never knew I could do that. Another capacity I’ve discovered is to be able to look deeply. I hadn’t known who I was, but with practice I saw the connection between who I am right now with all my suffering, habit energies and joy and with my childhood, my adolescent years and with my parents and ancestors. I can see the deep roots of my suffering and joy. I feel as if my psyche opens and insights that I didn’t know I had come out, from a deep place, what Thay calls the store consciousness. collective awakening of humanity, not started just by one person but there are little pockets of people everywhere who are coming to the realization that there is more to life than just material comforts and the suffering that they experience. It’s their suffering that brings this realization. TN: Yes, exactly. The suffering makes us want to seek out a spiritual practice that can help to alleviate it. There’s a lot of suffering in the world right now but because of that there’s more awakening. There’s so much mud, that the lotuses are blooming! As monastics we go out into the world to help even more lotuses to bloom. TM: Can you share a story about Thay that is particularly meaningful for you? TM: I was in my seventh year as a nun and I was struggling a lot. I felt I hadn’t changed much, that I wasn’t practicing well, I was still having difficulties and suffering! Thay called me into his room and said “Learn to be like an orange tree. For an orange to be sweet enough to eat, it needs enough time and enough conditions. We cannot force the orange to ripen earlier”. That became a really important teaching for me. With the practice and the support of the Sangha and with time, I will change. And it’s true. From then until now all those difficulties that I had back then, they are no longer there. I’ve come to a point where I’m savoring the sweet fruits of the practice! And with the practice there’s always more to discover about myself and more fruits to taste. TM: If you had to sum up to a complete beginner “What do you practice in Plum Village?” what would you say? TN: We are practicing to wake up to our own beauty and capacities and also to the beauty around us. All we need to do is to come back to our breathing and body in the present moment and then we are wide awake to experience what is happening inside us and around us. Join Sister Tue Nghiem on the USA Miracle of Mindfulness Tour in New York, Mississippi, and California in Fall 2015. What a beautiful sharing! Sr. Tue Nghiem, your thoughtful insights come at a particularly good time for me (although I imagine such deep truth resonates like a bell regardless of when it is heard). I’m so looking forward to practicing with you in New York. Thank you for your courage, devotion, and fine example. Dear Sister Tue Nghiem and interviewer, thank you for this lovely vignette about your life. My heart was touched by your story about Thay’s metaphor of the orange that takes its own time to sweeten – very meaningful to me also, I’m so glad you shared it. The teaching of aimlessness has been a big help to me, as i was always hoping to become better. Now I can fully enjoy the process of ripening. Gratitude to you and for creating this wonderful opportunity to meet you, Tue, through ‘meet the monastics!” Susan, True Fragrant Ocean. Looking forward to seeing you at Deer Park. I’m grateful to know you a bit.